Find your perfect pair with the Kitchen Combination, featuring one of our favourite faucets matched with a best-selling sink. The Nola Pull-Down Faucet features an ergonomic dual-function sprayhead and top-quality components for maximum durability. The KHU100 30" Single Bowl Sink is made with premium 16G T-304 stainless steel, and fully soundproofed with NoiseDefend technology. This combo comes with a matching soap dispenser. Experience Kraus Quality, and outfit your kitchen in style. This Strive bar sink offers professional style with easy-to-clean curved corners. Made of thick, premium quality 16-gauge stainless steel, the compact basin features a sound-absorption system that significantly reduces disposal and dishwashing noise. This entertainment sink includes a bottom basin rack to help prevent scratches. 30 Inch. 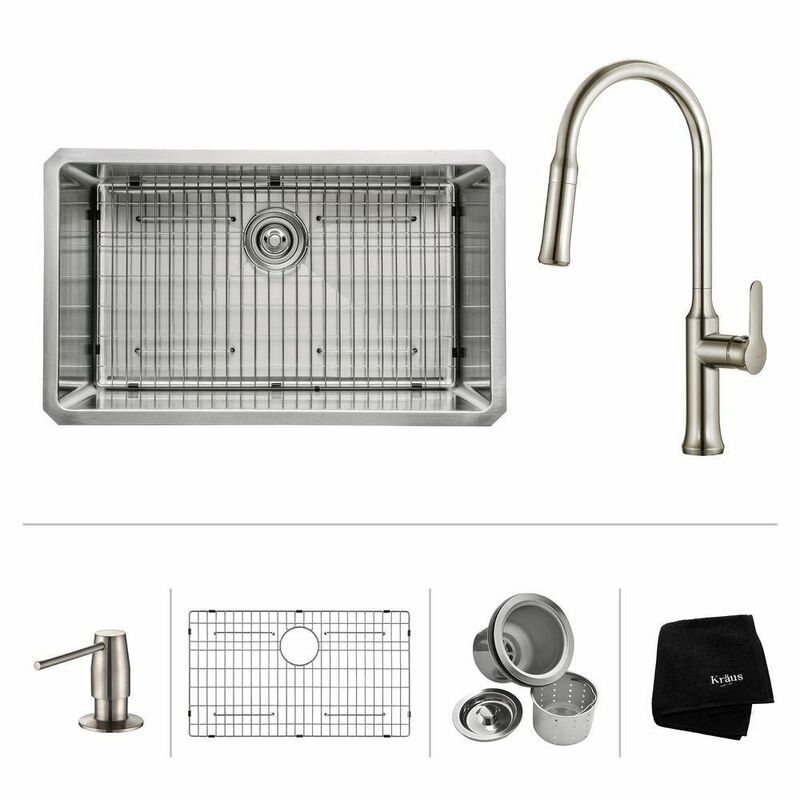 Undermount Single Bowl SS Sink W/ Pull Down Faucet & SD Stainless Steel Find your perfect pair with the Kitchen Combination, featuring one of our favourite faucets matched with a best-selling sink. The Nola Pull-Down Faucet features an ergonomic dual-function sprayhead and top-quality components for maximum durability. The KHU100 30" Single Bowl Sink is made with premium 16G T-304 stainless steel, and fully soundproofed with NoiseDefend technology. This combo comes with a matching soap dispenser. Experience Kraus Quality, and outfit your kitchen in style. 30 Inch. Undermount Single Bowl SS Sink W/ Pull Down Faucet & SD Stainless Steel is rated 4.3 out of 5 by 4. Rated 5 out of 5 by Heather from Fabulous Sink and Faucet! Product is a beautiful and highly useful! Received numerous compliments on the size and how beautiful it looks! Rated 4 out of 5 by Jp from Sink is very well made. Faucet ok but doesn't have... Sink is very well made. Faucet ok but doesn't have the feel of a really well made one. Will see how long it lasts..
Is there a spray action in this faucet?